STAY AT HOME MOM: WW 57 "Memorial Day Parade"
How sweet! I loved girl scouts as a kid. What a cutie pie. She looks so grown up. Also you can tell how much fun she was having. Congrats to her! How exciting. I too was a Girl Scout. I went all the way and started out as a Daisy. Some of my fondest memories are related to things I did with my troop. Great photos. I loved marching with scouts when I was a kid. 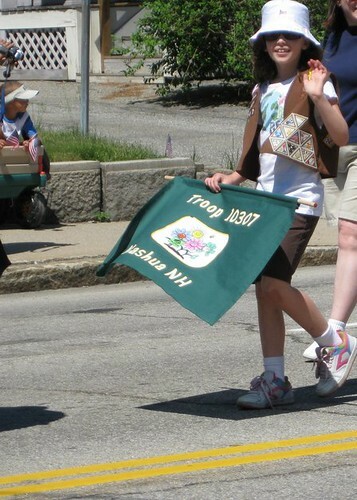 How fun that you had a memorial day parade! Good for her! I was a girl scout until I was 17... it's worth it, and a wonderful experience! I can see that she's enjoying it. Happy WW. I love parades! Kewl photos ... she's adorable. She looks so cute in her little hat and sunglasses. What great memories to participate in a parade! i cant wait to have a little girl scout of my own! right now we just have a boy scout in training...lol! She looks great...and has a cute parade wave! I always thought their little brownie outfits were the cutest : ). She's so cute. Love the hat. How neat! 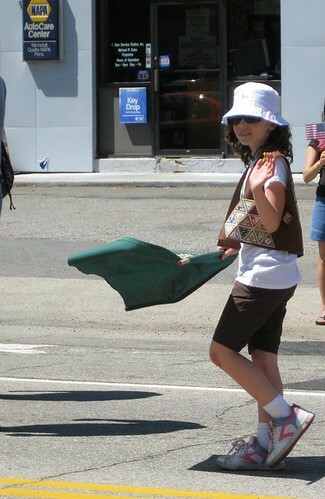 I was a girl scout when I was much younger, lol. She is so cute! That makes me very nostalgic, I remember my daughter marching in parades with her troop, they were always so thrilled and cute! Congrats to your daughter for becoming a Junior!! She's pretty just like you. Sorry for dropping by just now. Rested for a while. Thanks for your prayers. Beautiful photos! It looks like she was really proud to be in that parade. I just wanted to let you know that this weekend I'll be posting the June comment challenge button and linky.